Length x Width Colorado is 380 miles long and 280 miles wide. Explanation The geographic center of Colorado is located in Park County, 30 miles NW of Pike's Peak. Borders Colorado is bordered by Wyoming and Nebraska on the north. To the south is New Mexico and Oklahoma. In the east, Colorado is bordered by Nebraska and Kansas and to the west by Utah. The southwest corner of Colorado meets Utah, Arizona, and New Mexico. This spot is known as Four Corners. Total Area Colorado covers 104,100 square miles, making it the 8th largest of the 50 states. Land Area 103,730 square miles of Colorado are land areas. Water Area Only 371 square miles of Colorado are covered by water. Highest Point The highest point in Colorado, and in the Rocky Mountains, is Mt. Elbert at 14,440 feet above sea level. Colorado is home to more mountains 14,000 feet or higher than any other state. Lowest Point The lowest point in Colorado is the Arkansas River at 3,315 feet above sea level. Mean Elevation The Mean Elevation of the state of Colorado is 6,800 feet above sea level. This is the highest mean altitude of any of the 50 states. Located in the Rocky Mountain region of the United States, Colorado is not all mountainous. In fact, the eastern 2/5 of the state is quite flat. Colorado is rightly considered a state that reaches great altitudes however. The mean elevation of Colorado is higher than any other state and Colorado is the home of 54 mountain peaks that reach over 14,000 feet into the sky. The land areas of Colorado can be classified into four different regions; the Great Plains in the eastern 2/5 of the state, the Rocky Mountains in the central 2/5 of the state, the Colorado Plateau along the western 1/5 of the state and a small area known as the Intermontane Basin that lies north of the Colorado Plateau. Great Plains: The Great Plains region is part of the Interior Plain of North America that runs from Canada in the north, through the United States, to Mexico in the south. The Great Plains region covers, roughly, the eastern 2/5 of the state. The land is flat and dry, sloping gently upward from east to west to meet the Rocky Mountains. Rocky Mountains: Colorado is probably most thought of as a mountain state, perhaps because the mean elevation of Colorado is higher than any other state; 6,800 feet above sea level. The Rocky Mountain region of Colorado lies to the west of the Great Plains and occupies, roughly, the central 2/5 of the state. The Colorado Rocky Mountains are part of the Rocky Mountain chain of ranges that stretches from Alaska to Mexico. Colorado supports the highest mountain peaks in this mountain chain. 54 peaks reach altitudes of over 14,000 feet above sea level and more than 1,000 peaks are over 10,000 feet high. The Continental Divide runs through the Colorado Rockies. The Rivers and streams on the east side of the Continental Divide flow toward the Atlantic Ocean. 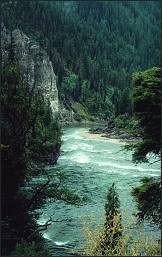 The rivers and streams on the west of the Divide flow toward the Pacific Ocean. The United States Geological Survey presents an interesting assessment of the biological resources of the Rocky Mountains in their Status and Trends of the Nation's Biological Resources. The mountainous regions of Colorado are the headwaters for six major rivers. On the east of the Continental Divide the Rio Grande, North Platte, South Platte, Arkansas and Republican Rivers all flow toward the Atlantic Ocean. On the west of the Continental Divide, the Colorado River flows toward the Pacific Ocean. Five mountain ranges make up the Colorado Rocky Mountains; the Front Range, the Sangre de Cristo Mountains, the Park Range, the Sawatch Range and the San Juan Mountains. The Front Range is the easternmost of the ranges and, along with the Sangre de Cristo Mountains to the south, form a mountain wall that separates the Rocky Mountain region from the Great Plains region in eastern Colorado. Pikes Peak (14,110 feet) is found in the Front Range. West of the Front Range is the Park Range which stretches from a point near the Wyoming border in north to the Arkansas River in central Colorado. South of the Park Range is the Sawatch Range where you'll find the highest peak in the Rocky Mountains; Mount Elbert (14,433 feet). The San Juan Mountain Range lies in the southwestern part of the Colorado Rockies. Read about the Ecoregions of the Rocky Mountains on the Sierra Club's Web Site. Colorado Plateau: To the west of the Rocky Mountains and running along the border of Utah is the Colorado Plateau. This area of hills, deep valleys, plateaus and flat topped mountains, called mesas, occupies the western 1/5 of Colorado. Read about the Ecoregions of the Colorado Plateau on the Sierra Club's web site. Intermontane Basin: The Intermontane Basin lies in the northwest corner of Colorado. The Intermontane Basin, characterized by rolling forested hills, plateaus and plenty of sagebrush, is the smallest land area in Colorado. Highest Temperature The highest temperature recorded in Colorado is 118°, Fahrenheit. This record high was recorded on July 11, 1888 at Bennett. Lowest Temperature The lowest temperature in Colorado, -61°, was recorded on February 1, 1985 at Maybell. Average Temperature Monthly average temperatures range from a high of 98.8 degrees to a low of 36.2 degrees. Climate Average yearly precipitation for Colorado, from 1971 to 2000, is shown on this chart from Oregon State University.